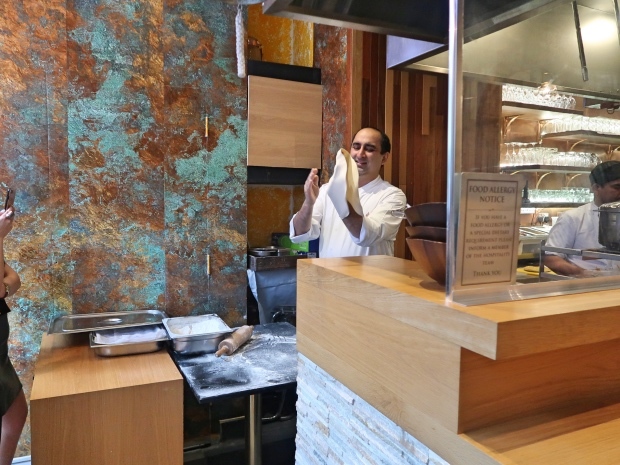 Indian restaurants seem to be the “hip” (cringe) thing right now in London. From high end establishments like the fabulous Jamavar to more casual restaurants such as Talli Joes, they seem to be popping up everywhere; each with their own modern twist and also the kind of places you can take your parents along to. I know, it seems boring for those of us who eat Indian almost everyday, BUT if its a trend that I can mostly partake in, then count me in! 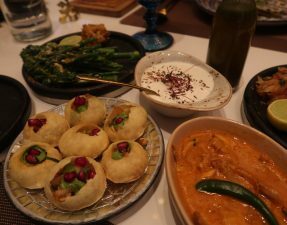 Last Wednesday, I was kindly invited to a blogger’s dinner at Hankies Cafe, a concept based on Delhi’s famous street food. Running from one dinner at Shakeshack to another dinner in Shaftesbury Avenue got me feeling ravenous and I couldn’t wait to tuck in! I usually like to order a few items that are a little different and in 99% of the cases, it never works in my favour. 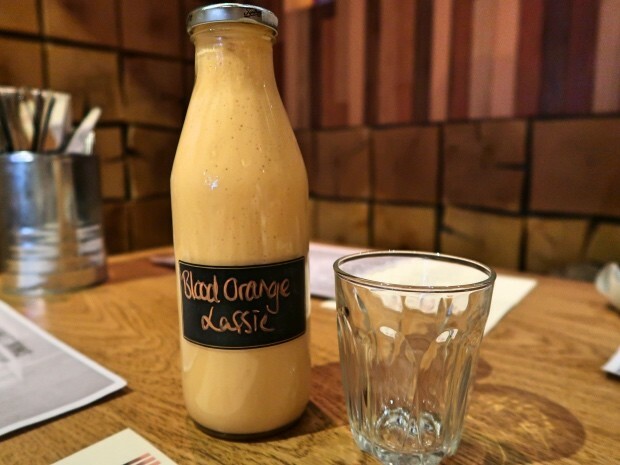 Luckily, this blood orange lassi was smooth and sweet with a little tangy aftertaste. 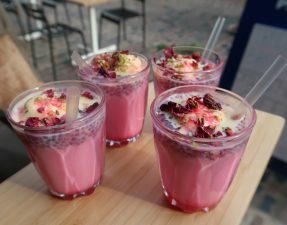 The blueberry lassi looked just as good. 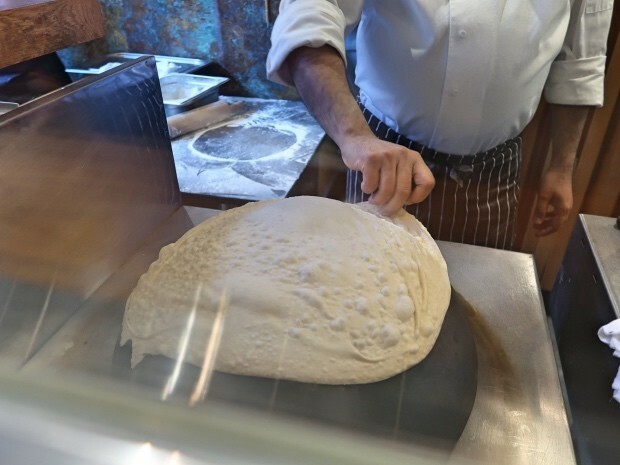 We watched the chef get a little handsy with the rotis, throwing and smacking them about until they’re paper thin. 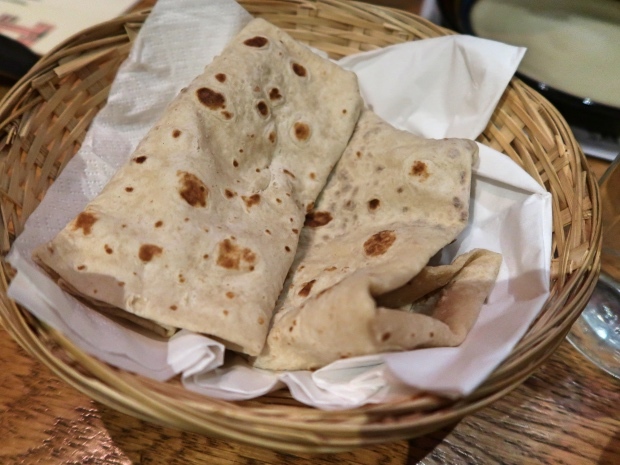 He then placed the roti onto a hot tawa and folded it into a hanky (thus Hankies Cafe). Theatrical, just how I like my food. I found the roomalis to be dry and could have done with a nice slick of melted ghee. FYI they do a truffle version [£4] which is stuffed with melted cheese (omg!). 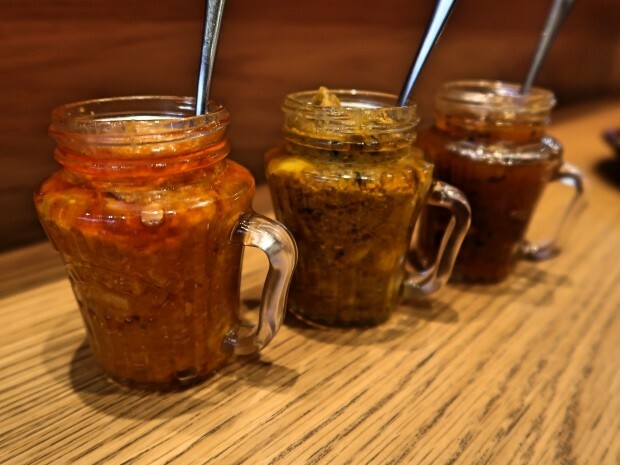 We were give three different achars and chutneys to sample with our freshly baked roomalis; mango & basil chutney, chicken achar (yes, you read that right), and a mushroom achar. My favourite was the mango chutney – not too bitter and was delectably sweet. 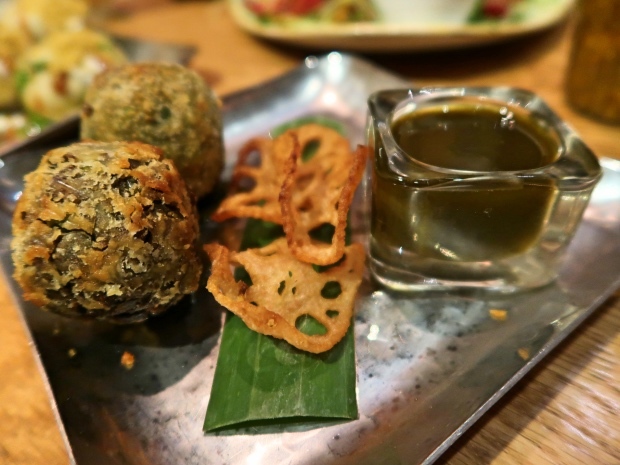 Mini round savoury dough balls stuffed with spiced green peas and deep-fried to a lovely crisp. 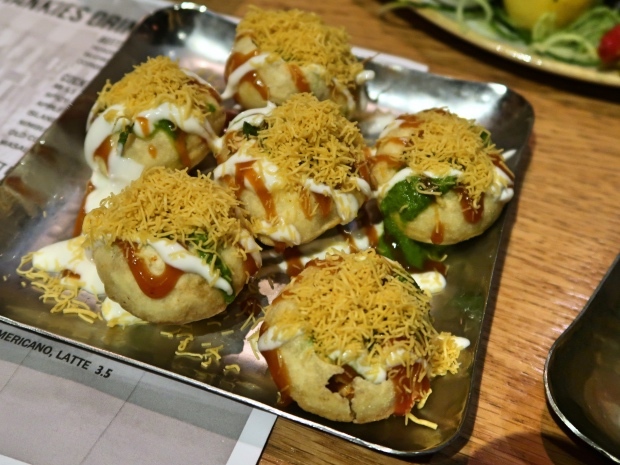 Kachoris are generally quite drying for the mouth so the tamarind chutney added a necessary dipping accompaniment. 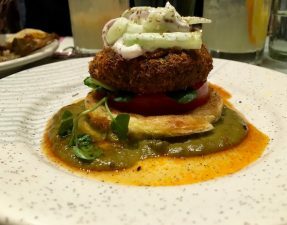 One of my top dishes; puris stuffed with lentils and potatoes, and topped with tamarind sauce, yoghurt, and a coriander chutney, plus crunchy sev too. Popping one into your mouth brought on an explosion of flavour and textures; from the tamarind’s sweetness to the crispy puri shells, it was great! Small, fat and juicy lamb chops that had been marinated in a fiery kashmiri chili, mustard, and paprika sauce, and grilled to a nice pinky medium. 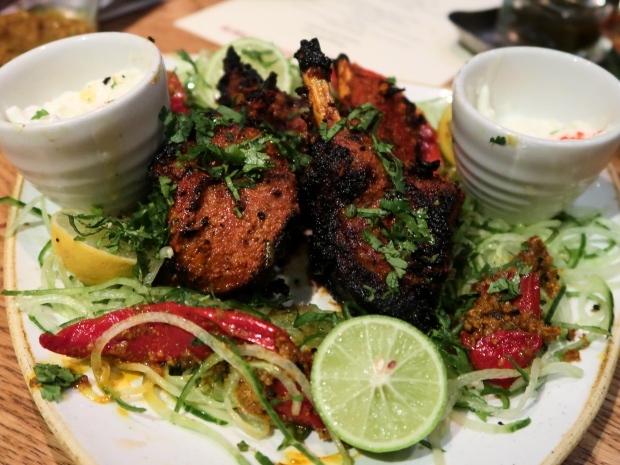 The fat instantly melted in your mouth and combined spectacularly with the spicy rub. One of my other favourite dishes of the night. Big, juicy chunks of chicken that had been placed over the small charcoal fire put to get those crispy, burnt ends. The chicken was insanely soft, having sat in a ginger and garlic yoghurt for a few hours, and had a slight caramelisation from the jaggery. A squeeze of lemon really sealed the deal for me, and I happily ate more than my fair share. I once had an offal experience (lol, I’m so funny) with kidneys back when I was a young’un and have not touched it since. When I saw that Hankie’s keema comes with chopped kidneys, I put on a brave face and chomped away. 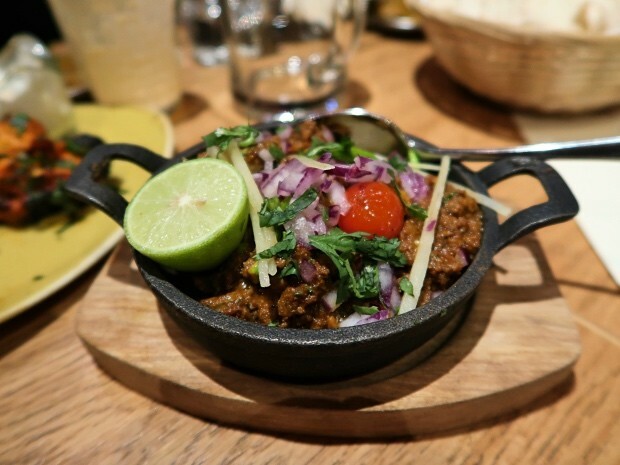 The kidneys were surprisingly smooth with a very slight tinge of offalness, and although the keema could have done with more of a kick, it was decent. I do wish they offered a version without any kidney blobs for those who don’t particularly want to eat organs. A classic Indian street food staple of mashed eggs, both boiled and half fried, mixed in with a good amount of Indian spices and shredded spicy crab too. 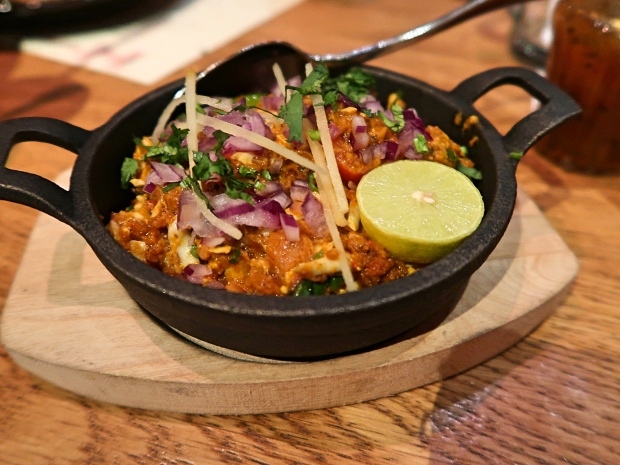 Unfortunately, the usual light, sweet flavour of crab was lost amongst the masala eggs, but was not missed as the golata was packed with flavour. 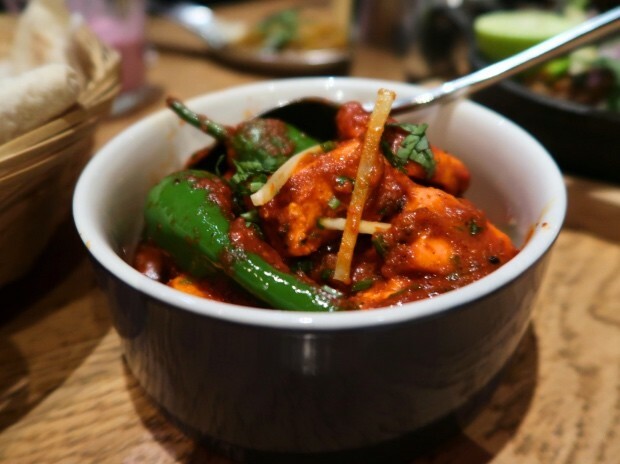 As one of the vegetarian curry dishes, Hankies Cafe serve up this pumpkin paneer swimming in a rich, red pepper curry. Weirdly, any flavour of pumpkin was lost on me, as was it lost on the table, and we could not figure out where it had been used. Was it in the curry? Nope. Was it inside the paneer? Definitely not. Nevertheless, the paneer was lovely and squishy, and the red pepper sauce really added a good spice to the cheese cubes. A classic creamy, black dahl; a lovely accompaniment to the other main courses. 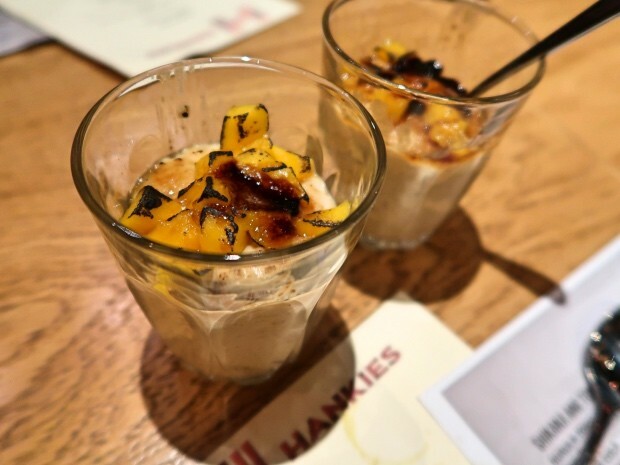 Creamy caramel and cardamon rice pudding topped with chargrilled mangos. A little heavy and sweet for my liking. 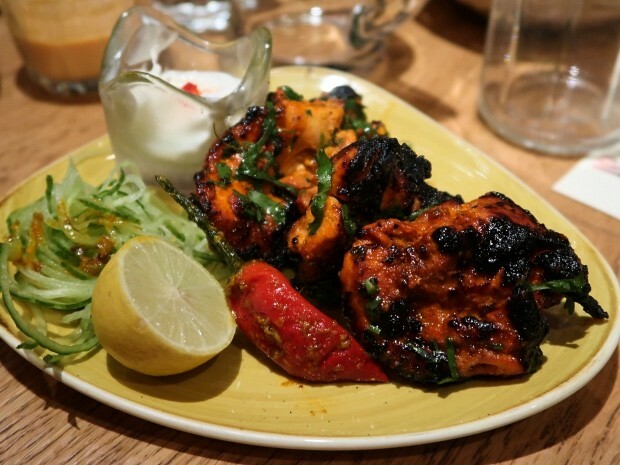 The total bill would have amounted to approximately £50 for two, including drinks, so £25 each but remember, we had ordered for a group thus so many dishes. 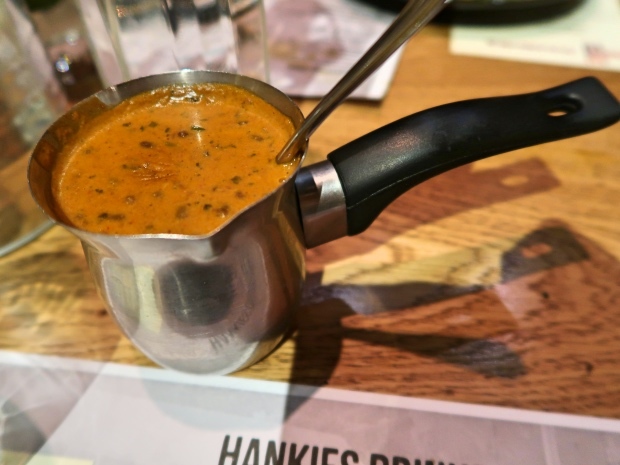 Hankies Cafe do a good job of showcasing Delhi street food and their grills really do steal the show (the curries pale so much in comparison) so its safe to say, I would happily take my parents there for dinner. However, would it be somewhere I would constantly return to? Only if I was in the area. I was invited to dine at Hankies Cafe.